Two Horizon 2020 projects are set to begin at the start of 2019 that will see the development of two new ultrafast laser systems. The first project, ‘Pulse’, is set to last for four years and will be coordinated by the Tampere University of Technology in Finland. It has been funded approximately €5.2 million under Horizon 2020 and aims to develop a compact 2.5kW laser that offers pulses ranging in duration from picoseconds down to femtoseconds at repetition rates of up to 1GHz, with exceptional beam quality. 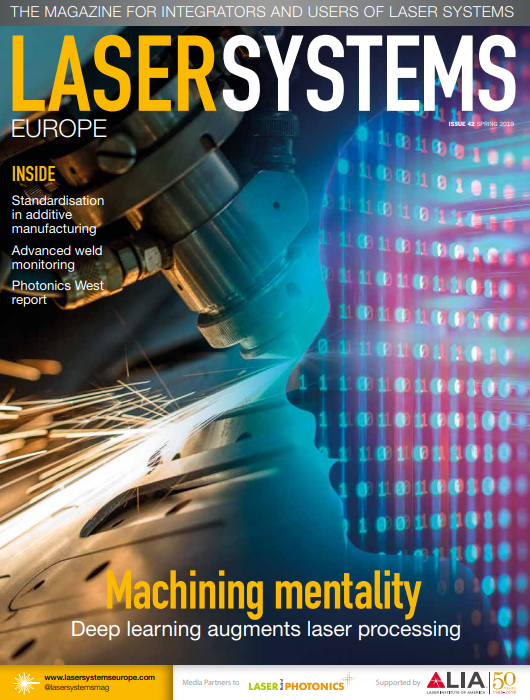 The laser will then be brought to market at highly competitive costs in order to enable its widespread uptake within industry. The second project, ‘Multipoint’, is set to last for three years and will be coordinated by Fundacion Tekniker, a non-profit technology organisation in Spain. It has been funded €4 million and will be developing a high-power 1.2kW femtosecond laser system with high pulse energy. The project also aims to produce a multibeam generation unit, a custom beam delivery scanner and a multibeam on-the-fly processing head that will enable high throughput micro-drilling to be performed on large titanium panels used in the fabrication of HLFC (hybrid laminar flow control) structures in the aerospace industry. The high beam quality sought after for the laser of the Pulse project will be achieved using tapered double-clad fibres – where the fibre core is surrounded by both an inner and outer layer of cladding – which will enable a beam propagation ratio (M2) of less than 1.1 to be achieved, along with pulse energies between 2.5-250µJ. Highly stable laser diodes will be used to seed the new laser, which will enable its pulse duration and repetition rate to be adjustable using ultrafast electrical control. This means a broad range of high-power laser processing applications in the automotive and renewable energy sectors will be able to be met using the new system, including ultrafast 3D ablation, low-thermal welding of dissimilar metals, and faster cost-effective cutting of ultra-hard materials. Pioneering technology based on 3D nano-imprint lithography will also be used within the project to produce coherent beam combining optics and fibre-facet-integrated micro-lenses for advanced beam shaping elements. In addition to the Tampere University of Technology, the Pulse project will also include its spin-off Ampliconyx, UK entities Aston University and Modus Research and Innovation, the Fiat Research Centre (CRF) and plastic fabrication firm Onostampi from Italy, the Hochschule Mittweida University of Applied Sciences and laser system manufacturer Lunovu from Germany, three partners from Greece (Prime Laser Technology, research and technology firm Nanotypos, and the Foundation for Research and Technology - Hellas) and fibre optics specialist CeramOptec from Latvia. The 1.2kW femtosecond laser source to be developed by the Multipoint project will maximise processing throughput by having enough power to drive several synchronised processes of percussion drilling at once. The project partners will develop a multibeam generation unit to split the main beam supplied by the new laser. This will be designed to optimise the energy balance per beam in a pattern determined by the particular requirements of the micro-drilling. Two strategies for delivering the multibeam pattern for percussion drilling will also be developed and tested within the project. The first strategy involves the development of a multibeam scanner based on galvanometric mirrors. Its custom design will include a sufficient optical aperture to take a number of parallel beams to a sample within a working field determined by a focussing f-theta lens. This will be done in a controlled environment by means of an inert Argon atmosphere chamber for process protection. The second strategy will involve the development of an on-the-fly processing head with pulse trains in a multibeam pattern, and an argon jet nozzle. The two strategies will allow the project partners to study the best processing approach using the new laser source. In addition to Fundacion Tekniker, the Multipoint project will also include French ultrafast laser firm Amplitude Systems, Belgian entities Laser Engineering Applications and the Multitel research centre, and Spanish firms Aerometallic Components and Antproject TVIP.